Cats are sensitive creatures. Because of this, cat toilet training can be challenging and requires lots of behavioral observation to determine causes of failure. 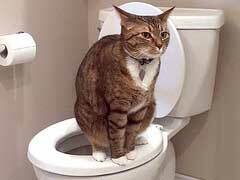 Toilet training cats is the easiest training task, but complications are not uncommon. This is a list of the 7 best tips for getting through the job of litter training your feline. 1. Spay and Neuter: Older kittens that refuse to take well to toilet training cats commonly do so because of hormones. Spaying and neutering eliminates most of these hormones, and should be done for all pets that are of age for the surgery. 2. Kittens: Kittens naturally want to be sanitary, but they don’t always get the point you are trying to make when cat litter training them. Kittens that don’t get the idea respond well to either moving the box to the spot they mess, or moving their feces to the litter box. 3. Spraying: Cat spraying indoors can be caused by a number of psychological problems. The most prevalent cause is hormones, see tip number 1, otherwise, major environmental changes or illness are common culprits. If solving these doesn’t help, there are a number of medications available from your vet that can. 4. Cat Urinary Tract Infections: These can be caused by external stress like those mentioned in tip number 3. Signs of a UTI are painful urination, defecating in the box but not urinating in it, and bloody urine. 5. Keep it Clean: The purpose of toilet training cats is to aid in cleanliness. If you can’t follow along on this task, your cat won’t either. Litter boxes should stay clean, other than small amounts of urine or a small amount of feces for scent, and be available at all times. 6. Sprays: For cats that continue to spray after you have tried everything, there are sprays and air freshener like products that can help. These contain pheromones that help calm territorial behavior. 7. Discipline: Cats are notorious for adverse reactions to discipline. Patience is the key and be sure you don’t equate the litter box to a place of punishment. This can cause your cat to avoid the box or mess in retaliation to punishment, confusing the task of toilet training cats even more.